[CLOSED] The 1BlessedNatural 2014 Christmas Giveaway! 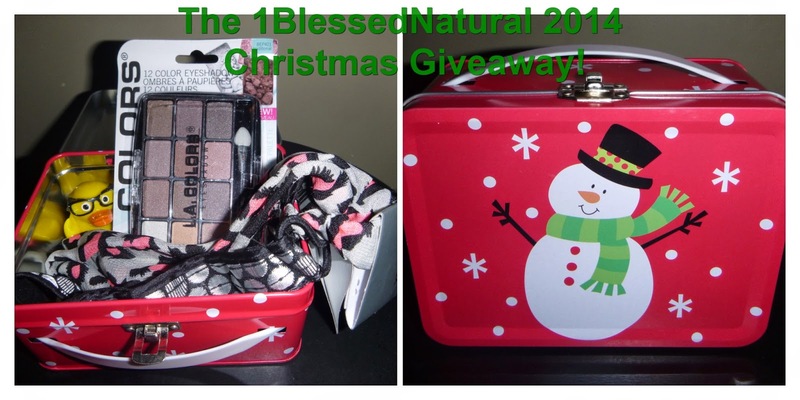 The 1BlessedNatural 2014 Christmas Giveaway! Happy Saturday, my blessed naturals! *1BlessedNatural is not affiliated with any of the companies or manufacturers of the products listed above. The 1BlessedNatural 2014 Christmas Giveaway will begin today and end at 12:00am on Saturday, December 6, 2014. The winner will be announced on Sunday, December 7th, 2014. I will create a new post to announce the winner, so please be sure to check the home page on December 7th. Also, please be sure to read and follow all of the giveaways rules to prevent your entries from being disqualified. Please add 1BlessedNatural[at]gmail[dot]com to your email address book to ensure that my email does not go into your spam box if you win. If you would like to sponsor my next giveaway, please send an email to the address above and type "Giveaway Sponsor" in the subject line. As always, I wish you all good blessings! You can enter the giveaway below.